2014 USA Games Sport-by-Sport Recap! Team Nebraska came to New Jersey. Team Nebraska saw New Jersey. Team Nebraska conquered New Jersey. After a week of intense competition at the 2014 USA Games, Team Nebraska returned home with great memories, new friends, and quite a of bit of heavy medal hardware for their efforts. All told, they earned 12 Gold, 11 Silver and 9 Bronze medals, which they were happy to show-off to the throngs of supporters who greeted them upon their return to Omaha at Epply Airfield. 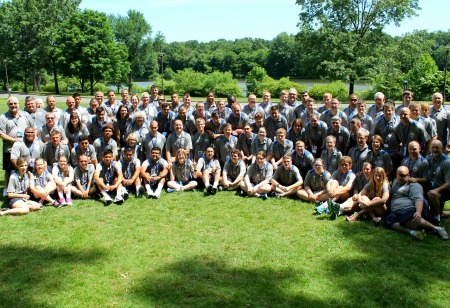 The delegation of 72 athletes, 20 coaches and 4 staff members spent their days at various venues competing against the best athletes in the nation, and spent their nights exploring the best that New Jersey has to offer. This included attending a New Jersey Thunder baseball game, cruising the Hudson River in the shadow of the Big Apple, and relaxing with teammates at the Athlete Carnival. Capping both ends of the trip were inspirational and star-studded Opening and Closing Ceremonies. Sports Manager Dave Demyan compiled the highlights of each event for this 2014 USA Games recap. Getting into the pool in New Jersey was just what these athletes needed to do to beat the heat. Team Nebraska swimmers took home 11 medals in the pool. Talisa Stumpf won an array of medals in her events, taking home a bronze in the 50 meter backstroke, silver in the 100 meter freestyle, and a gold in the 50 meter freestyle. Fremont swimmer Garrett Peterson decided the best way to stay out of the sweltering heat was to swim the longer races. And swim he did, winning a bronze in the 200 meter freestyle, and silver in both the 500 meter freestyle and the 1000 meter freestyle. Meanwhile Blair Bear teammates let New Jersey know what they were made of also. Matt Love showed he isn’t just a speeder on the track, but in the pool also. Matt earned a gold medal in the 200 meter backstroke, a silver in the 100 meter freestyle and a participation medal in the 100 meter backstroke. Not to be outdone, David Harkey used his height to his advantage grabbing a silver medal in the 50 meter breast stroke, and then taking it up a notch winning gold in the 100 meter freestyle and another gold in the 50 meter backstroke. When you compete at a venue like Princeton University, you bring your A-Game, and thankfully our athletes also brought along their NE-Game. The four members of Team Nebraska showed strong effort in their field events and the medal count continued to rise as they crossed the finish line on the track. Chad Magsamen may be small in stature but proved he’s got hops by taking second place in the Men’s Long Jump with a score of 4:73M. Tencie Tonniges collected a gold medal in the Women’s Shotput by launching that poor shotput into the New Jersey stratosphere and logging a jaw-dropping distance of 8.36M. Channeling her namesake, Skylar Simmonds sent the mini-jav Sky-high and picked up a Bronze medal for her aerial prowess. In the lanes, Scott Anderson was a blur of blonde hair and red jersey as he flew across the finish line in the 200M race, earning him a silver medal and a new personal best of 29.07 seconds. The Team Nebraska bowlers knew how to stay cool. They improved every day in the air conditioned lanes of the Brunswick Zone Bowling Alley in New Jersey. In singles competition Dori Zeilinger, and Nicole Elkmeier both grabbed a bronze medal. When it came to doubles, these ladies repeated that feat in the open division, showing the men that they were a force to reckon with. Bowlers Jacob Olson and Mark Mixan wanted in on some this medals action, and that’s just what happened. Mark having never broken a high game above 100 before decided that the national games was the time to do it. So he proceeded to do that 3 times in three games, helping he and teammate Jacob to a silver medal in doubles. But these bowlers were just getting warmed up. Hitting their stride and the pocket on both sides of the head pin, this team took home the gold in the team competition. If your keeping count that is a total of 10 medals for these 4 bowlers. Well there was no way to beat the heat on the Bocce court, so Team Nebraska decided to just beat the competition instead. In what was probably the longest and hottest day of the competition, Team Nebraska showed the other states how to kiss the palina. In individual action Kevin Teachman took home the silver, while Jimmy Volpert just missed the bronze taking home a fourth. But it was a different story whey it came to doubles. Father and son team Joe and Jimmy Volpert rebounded to get the bronze medal, as did mother and son team Kevin Teachman and Marilyn Oharrow. Now that they had the field figured out they struck gold in the 4 person team division. Proving that Nebraska bocce was a powerful force. Ole………… ole… ole… OLE, soccer…..soccer!!!!! Obviously inspired by the World Cup, coaches Marla Grier, and Ivan Nuno had their players ready for action. When not chasing ghosts through the basement of Norsworthy Hall, the soccer team was chasing that gold medal. Showing that they came to New Jersey to do one thing, win. Proving that they were one of the favorites from the beginning, they never lost sight of that medal. Finally beating Team Washington in a close one 4-3 in the gold medal game, leaving them undefeated! Trying to repeat as gold medal winners from the 2010 games proved harder than anyone could have expected. Team Nebraska definitely had a bull’s eye on their back this year, and everyone was gunning for them. The flag football team finished pool play with a record of 2-2, and was forced to play in a “play in” game to get into the medal round. They were able to win that game to keep their hopes alive. However Team Nebraska was beaten on a touchdown with 19 seconds left of the first round game by the eventual gold medal winner, Team Maryland, 36-32. In the bronze medal game they were beaten by Arkansas in the last minute as well 29-26. Team Nebraska got 4th place in what was a very well divisioned contest. Golf this year took place at the lovely Mercer Oaks Golf Course in New Jersey. Mercer Oaks offers two championship style courses built in a traditional style with tree lined fairways, ample bunkers and challenging greens. And challenging they were. However our level 2 alternate shot team of Janet and Holly Busse tore through the course of trees and sand to bring home a silver medal for those Diggin’ Dolphins. They had a combined score of 223, just 5 shots off of the lead. The corn-fed powerlifting duo of Shannon Hernandez and Kendrick Luebbert showed New Jersey the real meaning of Husker Power. Hernandez made his Scottsbluff Coyotes proud capturing the silver medal in the Dead Lift. Meanwhile Kendrick, or should we just call him Mr. Luebbert after this competition, decided he was just going to win everything. Gold medal in the Dead Lift, a gold medal in the Bench Press, a gold medal in the Squat, and a gold medal in the three event combo with a total combined weight of 350 kg. For those of us on this side of the pond, that is actually 771.6 lbs! Way to go beast mode on the competition, Team Nebraska. Well both of our softball teams decided it was a better move to play in New Jersey rather than stay and watch the College World Series in Omaha. And that proved to be a good move by both teams. Each of the teams taking home some valuable medal. Traditional Softball was able to bounce back from a loss in the medal rounds to win their bronze medal game. While Unified Softball couldn’t keep up with Maryland in downpour of rain in the gold medal game, they still brought home a silver medal.